The growth in popularity of non-fiction film in the past several decades has included some important political documents and examples of advocacy journalism such as Fog of War, The Inconvenient Truth, Fahrenheit 451, and Taxi to the Dark Side. This year Laura Poitras won an Oscar for her Citizen Four, which profiles Edward Snowden. When accepting her Oscar, Poitras stated that “when the most important decisions being made, affecting all of us, are made in secret, we lose our ability to check the powers that control.” These movies serve to check that power. De Antonio, who attended Harvard with John Kennedy, was inspired by Jack Kerouac and Robert Frank’s experimental anti-commercial 1959 Beat film Pull My Daisy (with Allen Ginsberg, Gregory Corso, and Alice Neel among others). He saw films as “a way to make art out of political raw material.” His approach was to eschew narration and manipulation to explore “what is politics, who runs the country, how do they run it, and to what end.” He began with a straightforward record of the McCarthy hearings in Point of Order (1964), then released Rush to Judgment (1967), which is about the JFK assassination and false premises of the Warren Report. In the Year of the Pig (1968) was a clear-eyed look at the origins and effects of the Vietnam War while Millhouse: A White Comedy (1971) was fashioned out of a collection Nixon clips which follows his career from 1946 to his election as President in 1968. We as Americans have the right to feel, think, write, film anything we want. So I enjoyed testing the First Amendment. We got three great lawyers and the entire Hollywood community supported us. I stood there and read my statement in which I said I believe I have the right to make any film I want. To me that’s as clear an expression as there is of the First Amendment. 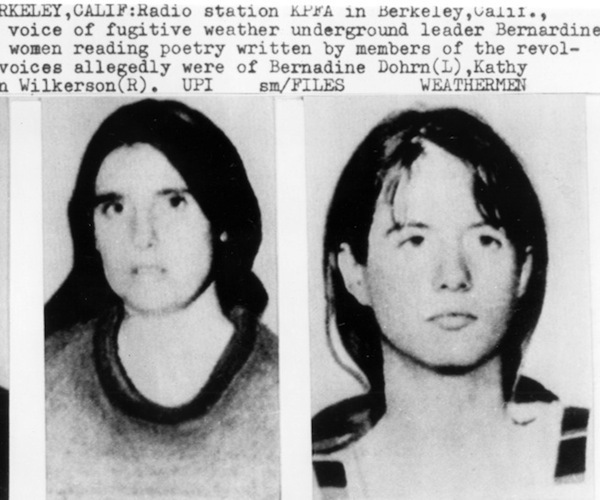 In 2002, Sam Green and Bill Siegel made a more traditional film on the organization called The Weather Underground. It is a well-made history, filled with surprising and forgotten facts about the rise and fall of the members and their controversial politics and activities. In Underground, shot in collaboration with Haskell Wexler (Medium Cool) and Mary Lampson (who also edited Harlan County, USA), the members speak entirely for themselves. These reasoned, committed, and radical young voices add significance and context to social and political struggles of the past. Today, corporations and billionaires buy our elected officials and America seems to be in a state of permanent war, with health care, education costs, and debt spiraling out of control. The time is right to listen to the challenging voices in Underground once again. An excellent hour long interview with de Antonio, who passed away in 1989, is available at The Film Archives. Pull My Daisy can still be seen on Vimeo. There will be a post-screening Q&A at the Brattle Theatre with Mary Lampson.